Brockton Location | Joel H. Schwartz, P.C. For those on the South Shore, our Brockton location may be more convenient than meeting in our Boston office. Our law firm has been at this Brockton office location for over 25 years and is proud to serve the community of Brockton and its surrounding towns. 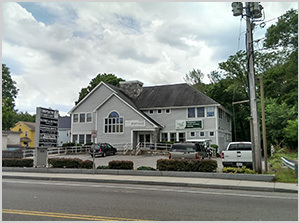 We’re centrally located near the heart of Brockton off of Route 27 (Pleasant Street.) Our regular hours are Monday through Friday from 8:00 am to 5:30 pm. Call any time to schedule an appointment with one of our experienced personal injury attorneys. Take Route 24 North or South to exit 18 (which is Route 27). Take Route 27 South towards Brockton. You will end up on Route 27 and will see the Brockton Mall on your left. Proceed through the first set of lights until you get to the second set of lights which is the end of Route 27. There will be a gas station in front of you. Take a left (which is Pleasant Street). Follow the road 1/2 mile. On your right, just before the 7-11 store, which is on the left, you will see a large gray and white building. This is 450 Pleasant Street.